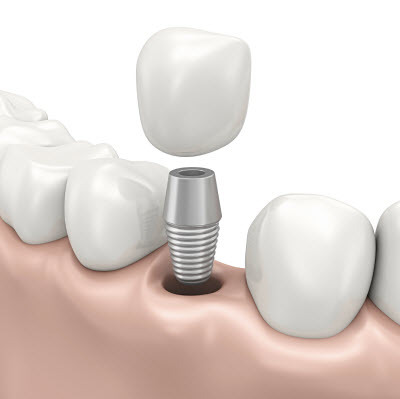 A healthy way to fill the space left after having a tooth extracted is placing implants to provide the utmost support to your restoration choice. Whether it is one tooth or many, dental implants grant strength, stability, and improved aesthetics to your smile. At Affordable Dental, our dedicated team has the artistry and board-certified experience to enhance the look and health of your teeth. We believe this procedure will leave you with stronger and more beautiful teeth. If you have questions about dental implants in Van Nuys, call our practice today! When having dental implants surgically placed, it’s beneficial if the office is equipped with the latest in technology and materials. Our office uses digital x-rays for precise imaging of the treatment area. Additionally, we utilize digital implant planning in order to assist with creating custom fabricated surgical guides for placement. This technology allows us to perform the entirety of the procedure on an expedited timeline if you have the periodontal and general health necessary to be a candidate. Your custom-made restorations are available in ceramic, porcelain, zirconia, porcelain-fused-to-metal, and gold. We work with trusted labs in our area that provide the same quality care as our office. Before placing the implants, we’ll conduct a full examination of bone and gum tissue to ensure they are healthy enough to support an implant post. If you are lacking a strong foundation of oral health, we can perform bone grafting, ridge augmentation, or sinus lift as needed. Once the area has fully healed, usually after several weeks, the implants can be placed. In every case, implant placement at Affordable Dental is performed by board-certified periodontists and oral surgeons. Our specialists possess the expertise and training to conduct implant services at a level of precision beyond what general dentists are often capable of providing. For those with a strong aesthetic interest, we offer custom shading for all restorations to best match the look of the remaining teeth. When making a recommendation for a restoration, we factor in longevity and appeal over the course of treatment, keeping in mind strength and health factors. At Affordable Dental, we aim to provide you with quality care and exceptional customer service each time you visit. If you have missing teeth in need of replacement and live in Van Nuys, Panorama City, Reseda, and the surrounding communities, give us a call and see what we can do to help improve your smile.